A brilliant inventor creates the world’s first time machine. After explaining its inner-workings to guests of his weekly dinner parties, he arranges for a follow up meeting about a week later. When the group convenes, they find the scientist exhausted and weathered. After cleaning up and consuming a well deserved meal, he sits down to tell of his journey over 800,000 years into the future. Damn, this book is old. In fact, I’m certain it is the oldest novel I’ve yet to read clocking in at one hundred and twenty one years since initial publication. 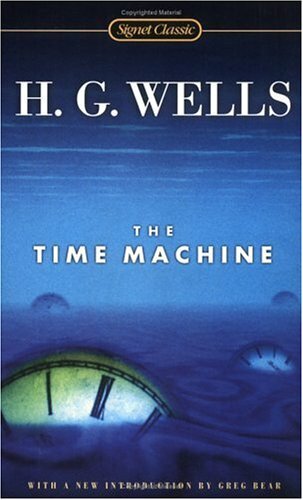 Wells seemingly went to great lengths to explain to the reader how a theoretical time machine would operate and I often wondered if Wells had built one himself based on how detailed his explanations and theories were. It would certainly explain the theory that the author himself is the main character. That isn’t to say it’s too philosophical and technical, there is quite a bit of action and danger. The events in the future carried with it a constant sense of urgency. Whether the traveler is trying to understanding his surroundings, avoid capture or trying to find his missing time machine, the action moved at a brisk pace. In fact, a memorable moment had the traveler racing forward in time, worrying that a pillar or some kind of concrete structure may now be erected in the spot he occupied when he initially began his journey. Would he become a part of the object when he slammed on the brakes or would his machine and body simply explode? The story would be a hell of a lot shorter if he ended up like Han Solo encased in carbonite. While I enjoyed the world building and the spectacle of time travel, I found myself re-reading passages over and over again as I struggled with Wells’ writing. I’m sure prose like this was probably commonplace back in the late 1800s but it was a major hurdle for me in 2013. However, you probably don’t need my endorsement or recommendation, this book is certainly a classic that inspired generations of sci-fi writers – it’s just not something I think I’ll find myself picking up again. October 7, 2013 in Classics, Fiction, H.G. Wells.